The 7th edition of The Park Hotels with Elle Decor student contest aimed at identifying new generation of designers across various disciplines and gave them an opportunity to showcase their work at the #InteriorDesign symposium held in Delhi. 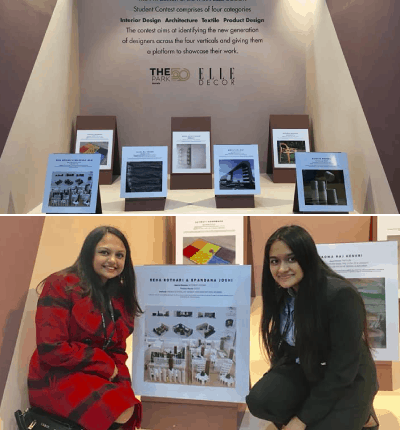 We are proud to announce that the winners in the Interior Design category are our own Senior year students – Reha Kothari and Spandana Joshi. Their project called Oasis was an approach to incorporate biophilic design with the future workspaces done as a collaboration with our industry partner Colgate-Palmolive India for their offices.